I got a bee in my bonnet last weekend and decided that I couldn't bear to wear my same old bustle dress to Candlelight two years in a row, so I made a new 1869 outfit for the occasion. Luckily, this style of dress goes together quite easily, and I was able to pull all the supplies that I needed from my stash. All I had to buy this week was a $1 sprig of greenery for my hat. Now that's my kind of Christmas miracle! The gown is made with green plaid silk that I picked up at a Fabrique sale earlier in the year for $16. No, not $16 per yard - but $16 for the dress length. Best. Deal. Ever! I had no idea what I would make with it, and I usually try to avoid adding things to my stash without a plan, but this was just too good of a deal to pass up. My students pointed out that the fabric looks like a roll of Scotch Tape, and wow - yeah it does! Maybe I can convince Scotch to sponsor my dress if I sew a big product patch on my back like a race car driver. 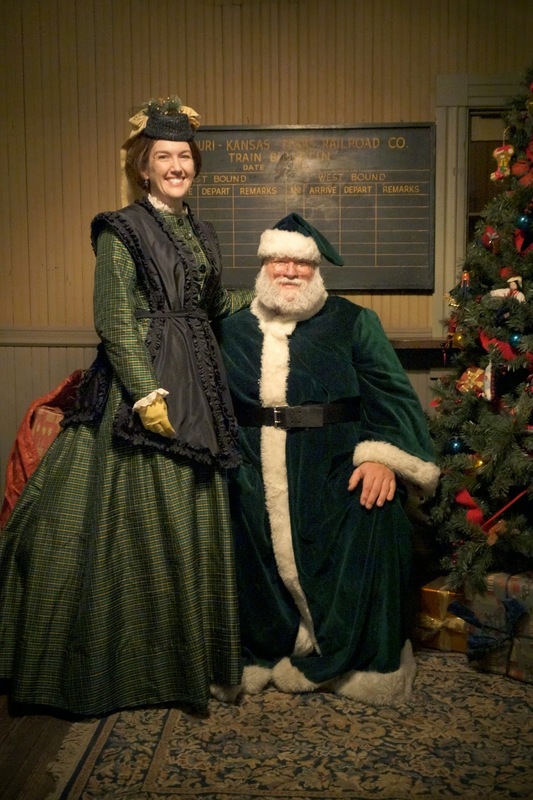 But even though I do look a bit tape-ish, I thought the green was quite festive, and I matched the event's Victorian Santa so well. To make the dress, I used a combination of patterns from Patterns of Fashion and Theatrical Costumes for Stage and Screen. It's a pretty simple dress on its own, and the only embellishment is a set of antique glass buttons with flowers cut into them. 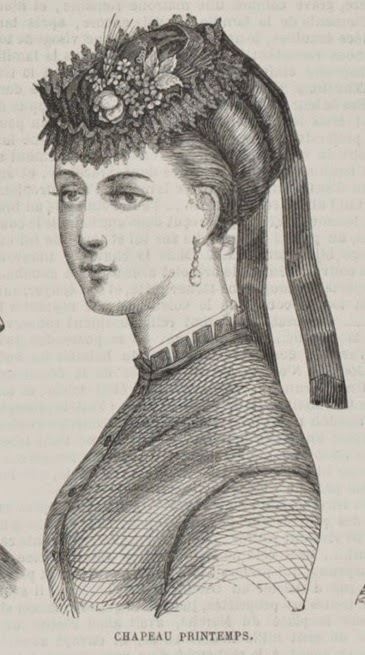 At first, I thought about adding fringe or rows of trim on the dress, but then I fell in love with a 1869 fashion plate from La Mode Illustrée showing a similarly austere gown worn with a black tunic over it. 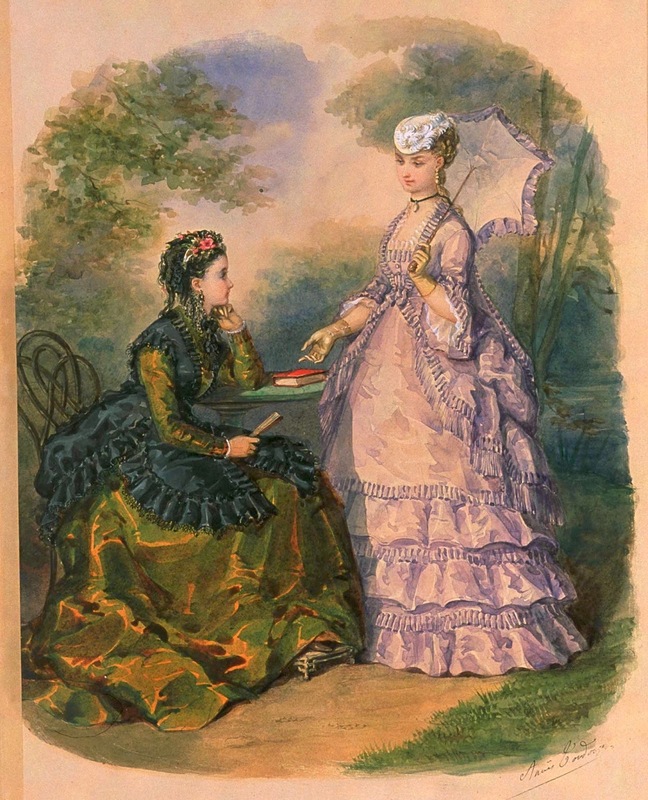 I poked around and found several period patterns for this type of garment, including one in the book 60 Civil War-Era Fashion Patterns that is referred to as a "pannier mantilla". I loved the description, which states: "a more useful article of dress is not likely to appear this season, and will more than repay for the slight trouble of making it." How charming! I also found a similar garment and pattern in an 1869 copy of de Gracieusse that is archived on the Het Geheugen van Nederland archive (search for "gracieuse" plus the year that you want to find the magazines). This mantilla, which you can see in the middle of the top and bottom row of the illustration above, is a little more fitted and has an open V-neckline, so I used the body from this pattern, and the pannier flounce from the other. I always love detangling the pattern sheets in these old magazines, and somewhere hidden in this jumble you can find the pieces for my mantilla. On the way to the event, I stopped by my favorite Victorian chapel and took a few pictures. Here are some of my favorites, and as usual, there are more on flickr, plus a few others of our group at the Candlelight event. It looks absolutely precious on you! Very well done! Gorgeous!!! I love the mantilla! Wonderful! I so enjoy watching these projects of yours! Lovely--and a great change from your previous red Victorian Christmas dresses. Thanks for sharing the photos with us! So gorgeous! I love the shape of this dress, and the mantilla is beautiful! The trim is a lovely accent. OHMYGOSH!!! Ok, I am so loving this dress!! And yes...best.deal.ever! Yay for 16.00 whole-dress-cost-silk! I am so jealous! But my favorite part of the whole outfit is the fact that you added that yellow to your hat and gloves! Color combos like that make me so happy!! You look GORGEOUS! LOVE! I love it so much! Also, thank you for making late 1860s things. Without you, I would be so lost and confused about the skirt cut and shape. I'm still struggling to get it right, so it helps immensely to see you wearing it all as it should be. Smashing! The black and green look so wonderful together! That's gorgeous, and such an unusual design. Very well thought out, beautiful colors, and just plain amazing. So pretty! And 16 bucks! Sweet! I'm running out of superlatives! Artistic eye, perfect execution and an enviable photogenic visage. The mantilla rocks! Such a lovely silhouette! It really is lovely, I love the plaid. Can you share what underpinnings you are wearing for this dress/time period? Thanks! 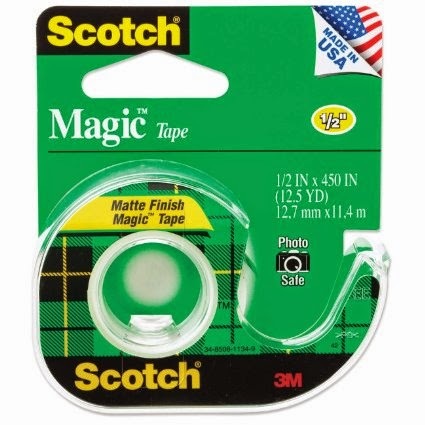 You don't look like Scotch tape AT ALL. It is a lovely dress. Your gloves—I have been looking for dress gloves for ages. Where do you get them, please? Hello. I write from Spain, here are a few admirers. Spain recreation of the Victorian era is still beginning, but every day we are more. 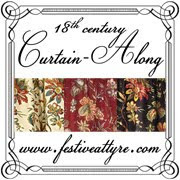 The fact is that in the 1880s no pattern remains. I've seen you link to a Dutch museum and you use the magazine "Gracieusse". Do you only download or use as a guide? I'm used to working with authentic standards of time and would like to download these from the Dutch museum, but I quite understand if I can download them. Sorry if abuse your good work, and I read that you're not in a good moment and I would not bother.